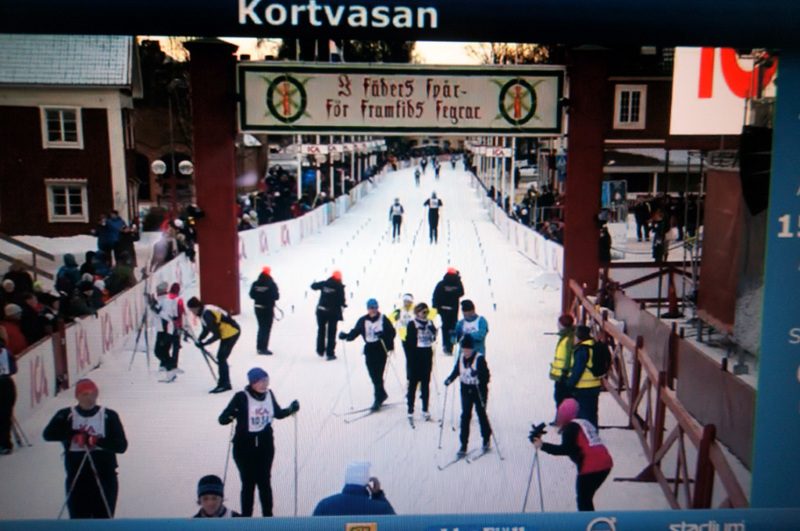 The skiing marathon Vasaloppet is probably one of the most classic and traditional events in Sweden. By now there is not only one race but a whole week of competition that caters different classes of participants. Since this was my first time, I decided that it would be the wisest to decide for a modest distance, instead of the full 90km race. I had done fairly little training specifically for cross-country skiing, but I had my hopes up that all other excercise I had been doing would be sufficient. The day before the race we had to drive about seven hours from Jotunheimen in Norway to Mora and I felt everything but fit on the morning of the competition. With headache and unsteady stomach I was waiting on the start line with about thousand fellow excited skiers. All in all, this day of competition, the Kortvasan, had 7000 participants. I had low expectations on the quality of the tracks, after so many others had already gone through them. But fortunately the weather stayed cold and there were still some frozen rails that made coming forward rather easy. The first kilometers were rather slow, the group of starters were still so close to each other that I could hardly make a move without having another ski stepping on mine or a skiing pole almost stuck in my face. After about half an hour the whole situation loosened a little bit- the faster skiers were already far ahead of me and the slowest ones were left behind. After some more kilometers I even started to overtake some skiers that had started in other groups earlier than me. That was easy to see by the system of startnumbers. everybody with 11xxx had started at the same time then me, 10xxx a quarter earlier, and so on. After two hours I had even spotted some 4xxx, which means they had started almost two hours ahead of me. That was a nice motivation of course. But I also needed motivation: I still had a annoying headache and my stomach hurt with every movement. But in the end, after some pretty long 30km, I came into Mora. 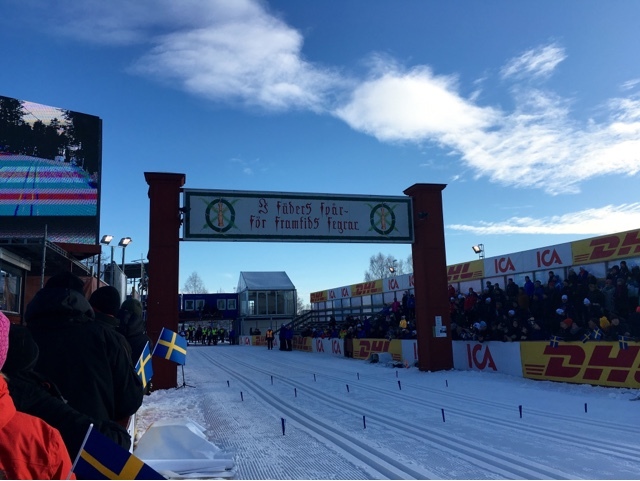 My time was not really worth talking about, but it was a nice start into the exciting world of cross country skiing competiton and I’ll be back for sure, maybe even with some more training and perhaps even on a longer distance. Some meters to the finish line, picture taken from a live video stream of the event. Since I was busy skiing as fast as I could, of course I didn’t take any pictures on this occasion. 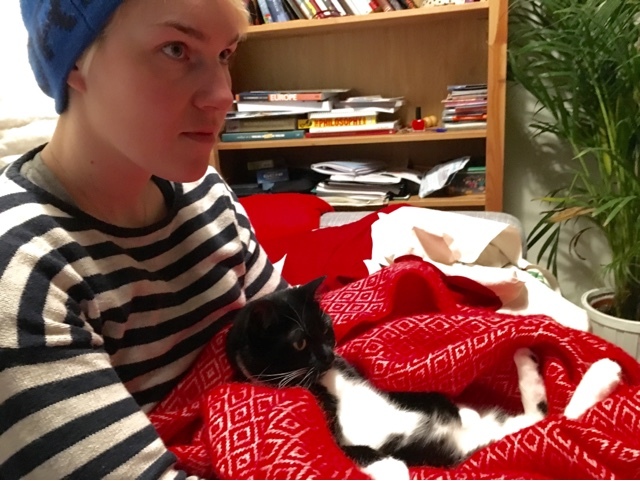 After this adventurous month, now, I’m finally at home, watching tv with the cat.